PlayerUnknown's Battlegrounds Mobile has launched a new tournament like league challenge in association with Star Sports. PlayerUnknown's Battleground Mobile premier league 2019 is just like an IPL of Battle Royale game. PUBG mobile Premier League is a special event where teams will participate to accumulate runs which can be gathered by playing the game. Getting chicken dinners while participated in PUBG mobile premier league will grant you with extra runs. 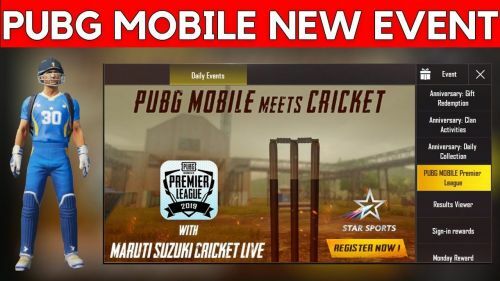 PUBG mobile Premier League will offer top 3 run scorers from each team a chance to play with their favourite cricketers live on Star Sports. PUBG Mobile IPL event was a result of PUBG collaboration with the sports telecasting channel Star Sports. This collaboration might prove to be a great advertisement for both parties. PUBG Mobile Premier League registration starts from April 12, 2019 to May 1, 2019. Players can register for PUBG Mobile IPL event, PlayerUnknown's Battleground Mobile Premier League right here. Now after registering the players will be given 8 IPL teams to join. After Joining start playing the game and accumulate points for your team. Among the 8 teams, from each team top 3 scorers will be selected. A total of 24 players will get a chance to play with their favourite cricketers live on TV. The evaluation of runs will be done on May 2, 2019, if you haven't registered for PUBG Mobile premier league then go register yourself and win those chicken dinners for scoring high runs. After registration you can start playing the classic matches In nay map or mode as your preference. After registration your stats will be calculated to form each match you play in PUBG Mobile classic mode. Stick to Sportskeeda and Follow me for future updates on PUBG Mobile Premier League and other Videogames.